Firming Dry Body Oilis intended for daily care of any skin type, also dry, sensitive and without firmness. High concentration of macadamia oil acting in synergy with argan oil and vitamin E, intensively firms and tightens skin, restoring its velvety smoothness. Effectively reduces cellulite and prevents stretch marks. Stimulates skin cells to renewal and prevents ageing of epidermis. Reinforces natural hydrolipidic coat of epidermis preventing excessive loss of moisture. Restrains skin ageing processes, protecting skin cells against destructive action of free radicals. Effectively improves its resilience, elasticity and hydration. Light, silky consistency absorbs perfectly and does not leave greasy coat. Macadamia oil,a source of unsaturated fatty acids omega 3 and 6, minerals, vitamins A, B, E and lecithin, nourishes and regenerates epidermis. Reduces cellulite and prevents stretch marks. Moisturises, smoothes out and softens skin. Thanks concentration of palmitoleic acid, an ingredient naturally existing in human’s skin, is perfectly absorbed and tolerated by sensitive skin. Soothes irritations. 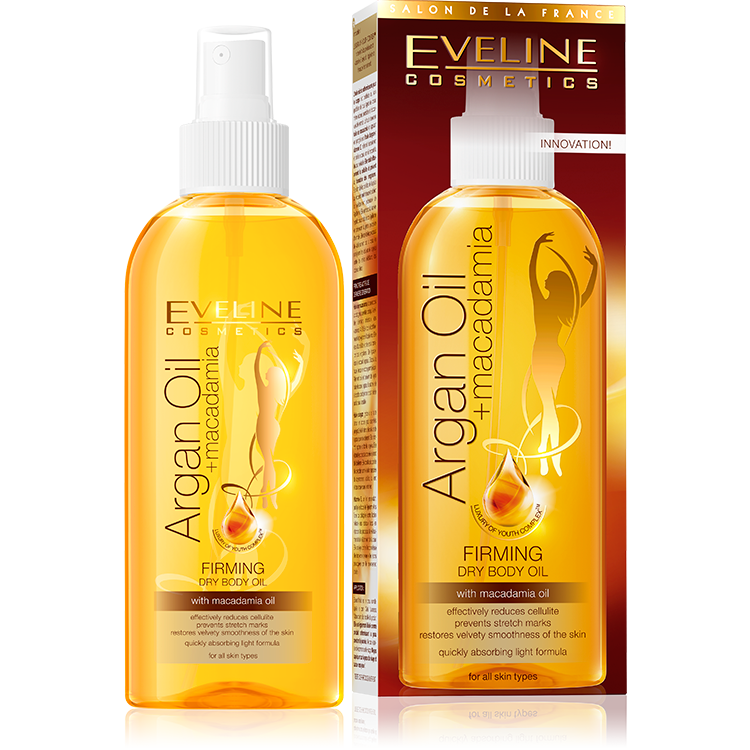 Argan oilthanks to content of unsaturated fatty acids omega 3, 6, 9, stimulates skin cells to renewal. Restores proper hydrolipidic coat of epidermis, ensuring long-lasting hydration. Intensely firms and tightens skin. Delays ageing processes of epidermis. Is a protecting barrier against aggressive action of sunlight, wind and extreme temperatures. Vitamin E,strong anti-oxidant, protects epidermis lipids as well as collagen and elastin fibres against destructive action of free radicals, delaying the processes of skin ageing and flabbiness. Protects against harmful action of externals and injuries caused by solar radiation.